AMU 2019: Aligarh Muslim University (AMU) is a central university established in 1920. It offers courses in the field of engineering & technology, management, pharmacy, medicine, arts etc. To get admission to the courses offered by the university, candidates will have to appear in the entrance test conducted by the AMU and also have to qualify the exam. Latest Update: AMU 2019 Entrance Exam Dates hve been Revised!! Check the dates below.!! check the table below. 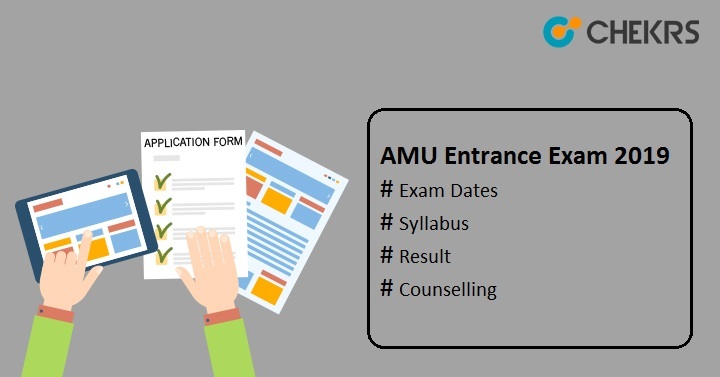 Latest Update: AMU 2019 Entrance Exam Notification Released, and Application Form is available now!! check the Last Date in the table below. Latest Update: AMU 2019 Entrance Exam dates have been released for various courses!! check the table below. The courses offered by the university are BTech/ BArch/ MTech (AMUEEE 2019)/ MBA/ BSc/ BA/ BCom/ MCom/ MA/ AMU MBBS- BDS and many more. All interested and eligible candidates can apply for the AMU Application Form. It will be available through online mode only from the month of February. Candidates are advised to check the detail information providing here to get admission in the AMU for the academic session 2019-20. Check the tentative AMU Entrance Exam Dates of different courses here in the table. Go to the AMU Entrance Application Form. Fill the all required details, upload the scanned images. Pay the application fee according the course you will apply. The application fee can be submitted through online mode only via credit card/ debit card or net banking. Marking Scheme 1 marks for each correct response. AMU Syllabus 2019 is given below check all the subjects according to Your Course. B.Tech The syllabus will be comprised of Physics, Chemistry & Mathematics subjects. MBA Questions will be asked from following topics Environmental Awareness, Quantitative and Numerical Ability, Comprehension and Verbal Ability, Reasoning and Intelligence and Data Analysis and Interpretation. BA LLB General English, Current Affairs/General Knowledge (with emphasis on legal issues) and Reasoning & Aptitude. Make a timetable and prepare yourself accordingly. Make points & notes on important topics and revise them regularly. Follow the exam pattern and give more time on the weaker topics & subjects. Take help of reference books and must go through the entire syllabus. Don’t waste time on electronic devices like Mobile, Laptop, and TV etc. The admission card will be issued by exam head controller of AMU on the official website only through online mode. AMU Hall Ticket can be downloaded one or two weeks before the date of examination. Check the following procedure to download the admit card. Follow the given link amucontrollerexams.com. Go to the “Admissions” tab and then select “General Admissions 2019-20” and click over it. Click on option “Download Admit card”. Enter course & application no and then click on button “Download AMU Admit Card”. Take the print of hall ticket during the examination. Go through the following steps to download the AMU Entrance Exam Results. Follow the above process to reach at the option “General Admissions 2019-20”. Click on the “Result Admission Test” option. The AMU Entrance Result will be appeared on the screen. Download it and then take the print of it for future use. The cutoff will be prepared for each course separately by the official authority of AMU. It will be released after the result announcement and will be available on the university website. All applicants will have to obtain the AMU Cutoff 2019 to get admissions into AMU for the academic session 2019-20. After the release of cutoff list, those who will acquire the cutoff marks will be called for the counselling process. AMU Merit List will be published by the university on its official website. It will be declared after releasing the result & cutoff. The list will include the name of candidates who will qualify the entrance exam by obtaining the cutoff marks. For each course, separate merit list will be prepared. In order to get admission into the various courses provided by the AMU, candidates will have to obtain the cutoff marks i.e. minimum required score. Based on the merit list, candidates will be eligible to take part in the AMU Counselling Procedure. Candidates will have to report at the counselling venues decided by the university, as it will be organized through offline mode and then will have to register for the counselling. Students will have to fill the choice form and based on the choice filled form & seat availability, seats will be allotted to the shortlisted candidates. To confirm the seats, students have to report at the university on the given date & time and will have to verify the required documents.